Yeah, Christmas again! Sorry! Bite me. Check out this Kabuki-inspired Bento Box Lip Set which will be on many a NARS’ fan’s Xmas wish list! Inspired by the Japanese Kabuki theatre, the set comprises: 2 lip colours (Maiko and Sakura), 2 boxed dish thingies and a rather lovely lip brush. Will the lip colours be in the dishes? I’m not sure… I got a bit confused at that point but it reminds me of a Japanese curio that Lisa Eldridge talked about. The lip shades are pretty darn beautiful. Look! Heavily pigmented and smooth, a pair of beautifully bright shades that are sure to tantalise and tempt! No price details or release dates yet, but I shall update as and when they become available. EDIT: I’ve now been reliably informed that this set is due to retail in the UK at £95 from November the 1st and will be available at Selfridges. In Kabuki theater there is a style, Kumadori, which uses shades to represent different emotions and moods: red represents passion and vigor while pink represents cheerfulness and youthfulness. So it is no wonder that François chose to capture the majesty of the kabuki lip with these two colors for the elegant yet modern woman. Maiko, a vibrant red, is the Japanese word for dancing girl and is used to refer to apprentice geishas. Sakura, a hot pink, is Japanese for cherry blossom, the symbolic flowering cherry tree integral to Japanese culture. Each cup has been hand-filled, weighs the same as a bullet of lipstick, and will provide around 150 uses. Similar to the NARS Yachiyo Kabuki Brush, the lip brush is hand-made and the handle is wrapped in Wisteria, a flowering plant native to East Asian states such as China, Korea and Japan. Only one thousand sets were created for sale in the United States, and just over two thousand in total were created worldwide. Yes, £95 *jawdrop*. It’s beautiful n’all… but erm… £95? Am I going to have to sell both kidneys to fund this I wonder? I don’t get it? You get those two minute little glass pots with a tiny bit of colour and those comparatively huge bowls? Or is that colour in the bottom of the bowls? Its pretty though! i don’t get it either but love the idea! I don’t really get what it is or how it works, but I want one anyhow. For those who ‘don’t get it’, I’m thinking you’ll get the box with the big pots in, that circle thingy is their lids and the little pots were probably sent so swatch curiosity could be satisfied before photos were taken Looks like a pretty set, though! By the way – have you tried these on lips? Could you comment on the texture at all? Just A Question, Ohh The Same as Ann’s Above Me Actually? Could You Comment ON The Texture? Oooh, I love the wrapped brush. What a nice touch. Unfortunately, I really dislike NARS lip products. Do these have the “”scent”” aka plastic of some of their other lippies? Like the colours and the packaging, I wonder what is the coverage like? 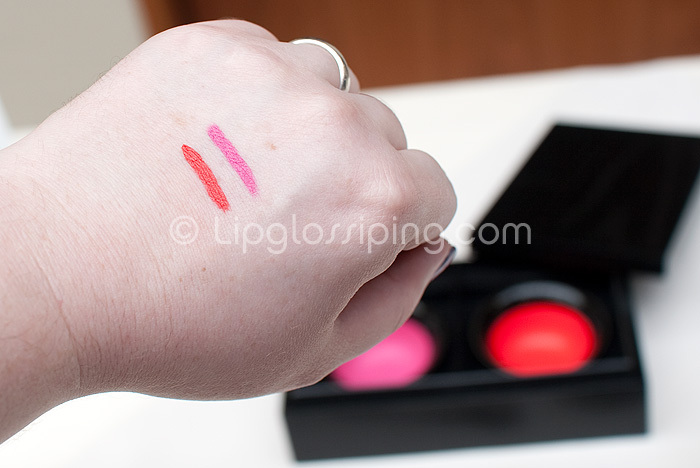 would it be like an ink or a laquer – I do think NARS do good lips. I love those colors! They are both so pigmented and bright! i’m SO asking for one of these for Christmas! Ooh, this set *is* really pretty! I can’t wait to see the stock images and find out if those lovely lip colours go in the pots. Whoever gets their hands on this baby will certainly be a lucky person!